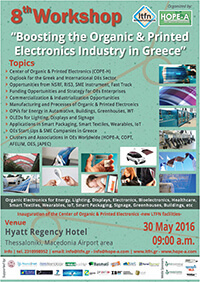 Press Release in CORDIS "Smartonics Result in brief"
HOPE-A co-organized with the Nanotechnology Lab LTFN with great success the 8th Workshop - "Boosting the Organic and Printed Electronics Industry in Greece" on Monday 30th of May. 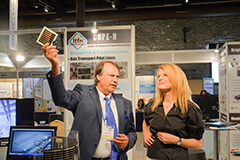 During the event, the participants had the opportunity to learn about the last Business and scientific innovations and new trends in the Organic and Printed Electronics industry. Distinguished guests from business, scientific and political sector, as well as national and public authorities’ representatives participated in the event. 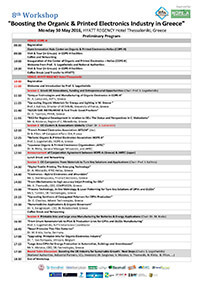 Among others with their presence honored the event Ms Maria Kollia Tsaroucha - Deputy Minister of the Interior for Makedonia and Thrace, Mr Vasileios Vairamidis – Brigadier General as a Representative of the political and military leadership of Ministry of Defence, Mr Theofanis Papas - Deputy Head of Entrepreneurship, Competitiveness and Environment of Region Authority of Central Makedonia and Mr Theodoros Papadopoulos - Mayor of Thermi city. 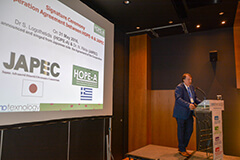 During the Workshop, Mr Marcos Bolaris - Deputy Minister of Agriculture, was informed about all the actions of COPE-H and HOPE-A. 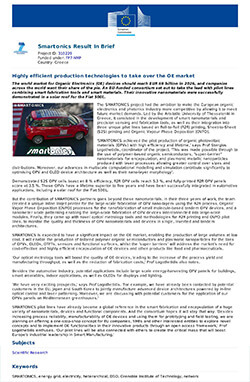 Highlights of the 7th Workshop - "Creating the Organic & Printed Electronics Industry in Greece"
Below you can see some of the workshop's highlights. Moreover a visit to the new LTFN facilities - Center of Organic and Printed Electronics was performed.